LOUISVILLE, Ky. (AP) — Louisville and the rest of the world said goodbye to The Greatest on Friday, showering affection on Muhammad Ali during a fist-pumping funeral procession through the streets of his hometown, followed by a star-studded memorial service where he was eulogized as a fiercely charismatic breaker of racial barriers. "He was a tremendous bolt of lightning, created by Mother Nature out of thin air, a fantastic combination of power and beauty," comedian Billy Crystal said in an address that had the crowd of about 15,000 laughing at nearly every turn. The more than three-hour memorial capped nearly a full day of mourning in Louisville for Ali, the boxing great who died last week at 74 after a long battle with Parkinson's disease. Earlier in the day, an estimated 100,000 people holding signs and chanting, "Ali! Ali!" lined the streets as a hearse carrying the boxing great's cherry-red casket made its way past his childhood home to Louisville's Cave Hill Cemetery, where a private burial service was held for the three-time heavyweight champion of the world. "He stood up for himself and for us, even when it wasn't popular," said Ashia Powell, waiting at a railing for the funeral procession to pass by on an interstate highway below. The public memorial at the KFC Yum! Center was packed with celebrities, athletes and politicians, including former President Bill Clinton, Sen. Orrin Hatch, director Spike Lee, former NFL great Jim Brown, Arnold Schwarzenegger, soccer star David Beckham, Whoopi Goldberg and Kareem Abdul-Jabbar. Ali was saluted as a brash, self-confident and fearless man of principle, someone who went from one of the most polarizing figures in America to one of the most beloved. "I can just hear Muhammad say now, 'Well, I thought I should be eulogized by at least one president,'" Clinton told the crowd. Crystal cracked everyone up with his career-making impersonation of a boastful, fast-talking Ali — and his imitation of Ali's foil, sportscaster Howard Cosell — and rhapsodized about Ali's charisma, outspokenness and talent in a way that brought the crowd to its feet. "We've seen still photographs of lightning at the moment of impact, ferocious in its strength, magnificent in its elegance. And at the moment of impact it lights up everything around it so you can see everything clearly," Crystal said. "Muhammad Ali struck us in the middle of America's darkest night." He added: "Ali forced us to take a look at ourselves. This brash young man thrilled us, angered us, confused us, challenged us, ultimately became a silent messenger of peace and taught us that life is best when you build bridges between people and not walls." Kevin Cosby, pastor of a Louisville church, told the crowd that Ali "dared to affirm the power and capacity of African-Americans" and infused them with a "sense of somebodiness." He likened Ali to such racial trailblazers as Jesse Owens, Rosa Parks and Jackie Robinson. "Before James Brown said, 'I'm black and I'm proud,' Muhammad Ali said, 'I'm black and I'm pretty,'" Cosby said. "Blacks and pretty were an oxymoron." Rabbi Michael Lerner, a political activist and editor of the Jewish magazine Tikkun, brought the crowd to its feet four times with a fiery speech in which he referred to Ali's refusal to be drafted during the Vietnam War — a stand that cost him his boxing title. "Ali stood up to immoral war, risked fame to speak truth to power. The way to honor him is to be like him today," Lerner said, railing against anti-Muslim bigotry, drone attacks, the gap between rich and poor, and racist policing. Earlier in the day, Ali's casket, draped with an Islamic tapestry, was loaded into a hearse outside a funeral home. The pallbearers included former boxers Mike Tyson and Lennox Lewis and actor Will Smith, who played Ali in the movies. Ali's nine children, his widow, two of his ex-wives and other family members accompanied the body to the cemetery. The 19-mile drive took Ali's body past the little pink house where he grew up and the museum that bears his name. At one point, the procession traveled along Muhammad Ali Boulevard. 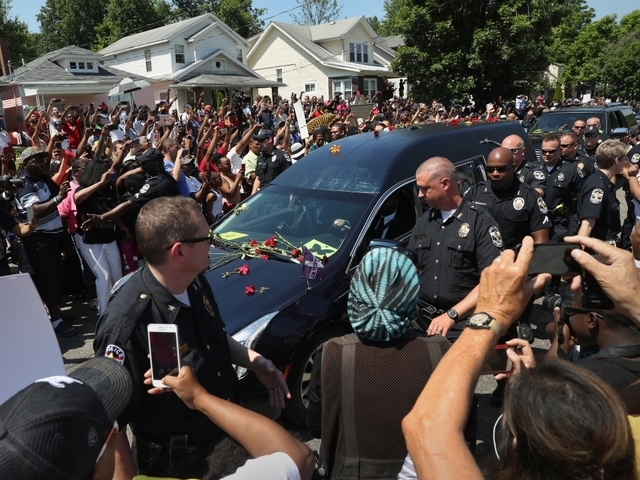 As the long line of black limousines rolled past, fans chanted like spectators at one of his fights, pumped their fists, stood on cars, held up cellphones and signs, ran alongside the hearse and reached out to touch it. They tossed so many flowers onto the windshield that the driver had to push some of them aside to see the road. Others fell silent and looked on reverently as the champ went by. "I've been crying all week," said Mike Stallings, of Louisville, who brought his two young sons to bid farewell to the sports legend who grew up as Cassius Clay. "As big as he was he never looked down on people. He always mingled among the crowds." Ali chose the cemetery as his final resting place a decade ago. Its 130,000 graves represent a who's who of Kentucky, including Kentucky Fried Chicken founder Colonel Harland Sanders. Family spokesman Bob Gunnell said he will have a simple headstone, inscribed only "Ali," in keeping with Islamic tradition. Ali himself decided years ago that his funeral would be open to ordinary fans, not just VIPs. As a result, thousands of free tickets to the memorial were made available and were snatched up within an hour. President Barack Obama was unable to make the trip because of his daughter Malia's high school graduation. But White House adviser Valerie Jarrett read a letter from the president at the service in which Obama said Ali helped give him the audacity to think he could one day be president. "Muhammad Ali was America. Brash. Defiant. Pioneering. Never tired. Always game to test the odds. He was our most basic freedoms: religion, speech, spirit," Obama said. Ali's widow, Lonnie, in her first public remarks since his death, took the stage in an oversized hat that shielded her eyes. "Muhammad indicated that when the end came for him, he wanted to use his life and his death as a teaching moment. He wanted to remind people who are suffering that he had seen the face of injustice," she said. "He never became bitter enough to quit or engage in violence." Rumors that Donald Trump would attend were quashed Friday morning when Gunnell said the Republican presidential candidate called Ali's widow to say he was unable to make it. People gathered early in the day outside Ali's boyhood home, which was decorated with balloons, flags, flowers and posters. Fans took photos of themselves in front of the house. Some people staked out their places nearby with lawn chairs. A sightseeing company offered tours of Ali's path through the city. Businesses printed his quotes across their billboards. City buses flashed "Ali — The Greatest" in orange lights. And a downtown bridge will be illuminated the rest of the week in red and gold: red for his boxing gloves, gold for his 1960 Olympic medal. "I just wanted to show respect to the champ," said Martin Dixon, who drove from Warren, Ohio, to watch the funeral procession from Ali's boyhood home. "He inspired the world. He shook up the world."